'Another Week Of Can-Kicking.' 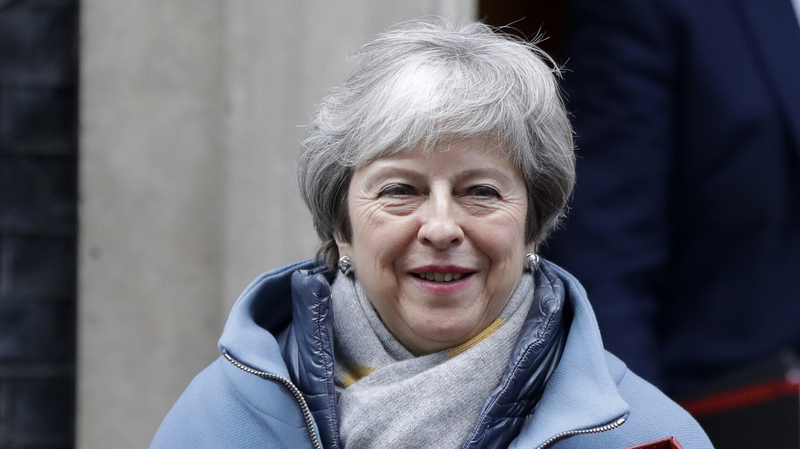 Theresa May Faces Wary Lawmakers On Brexit Deal British lawmakers urged Prime Minister Theresa May on Monday to make changes to her Brexit plans days after they defeated a previous offer. Prime Minister Theresa May leaves Downing Street on Monday to attend parliament. Britain's prime minister, Theresa May, faced hours of blistering criticism on Monday from more than 100 lawmakers who questioned her leadership a week after Parliament decisively rejected her plan for leaving the European Union and mounted a failed effort to unseat her through a vote of no confidence. May struggled to bring new ideas to parliament with just two months to go until the March 29 deadline for the United Kingdom to leave the European Union. "Good will is slipping away, as well as time," said Rupa Huq, a member of parliament from the Labour Party. May's proposed Brexit deal would keep the U.K. in the EU customs union until a permanent trade agreement could be worked out. This temporary fix would allow an open border between Northern Ireland, which is in the U.K., and Ireland, which is in the EU. Parliament crushed that idea Tuesday by a vote of 432 to 202. Lawmakers gave May three working days to come back with a Plan B. Little progress has been made. "We will work to identify how we can ensure that our commitment to no hard border in northern Ireland and Ireland can be delivered in a way that commands the support of this house and the European Union," May told lawmakers. May did have some good news for EU nationals: she announced she had taken steps to waive the application fee for those who wished to apply for the right to stay in the U.K. after Brexit. That fee is usually 65 pounds, or about $84. That drew rare praise from members of parliament, who have otherwise pulled May's plans apart in multiple and conflicting directions. They described her government as shambolic, a farce and an embarrassment. Jeremy Corbyn, leader of the opposition Labour Party, said the debate over Brexit reminded him of Groundhog Day, and he demanded parliament be given more say in the contents of a deal. "No more phony talks," Corbyn said. "Parliament will debate and decide and this time ... I hope and expect the government to listen." Dominic Raab, a Conservative MP who resigned as Brexit Secretary in November, urged May to rule out asking for an extension for implementing Article 50, which is the process of getting the U.K. out of the EU. "Can I urge my right honorable friend to not just rule out revoking Article 50, but rule out extending it, because that would give businesses certainty and give the public some finality and some reassurance that we will leave at the end of March, as promised," Raab said. That demand is opposed by Defense Minister and Conservative MP Tobias Ellwood, who earlier Monday tweeted a photo of his son eating banana cake to underscore his request to extend the Brexit deadline. "Cooked a banana cake yesterday," Ellwood wrote. "Told my son it will be ready in 20 mins - according to the cookbook. It took 30. It was a big decision - honouring the cookbook or take more time to get the right result." Cooked a banana cake yesterday. Told my son it will be ready in 20 mins - according to the cookbook. Labour parliamentarian Chris Leslie urged May to consider a new referendum. "Why does she keep leaving out the option of a people's vote?" Leslie asked of the prime minister. "The decision was made in 2016 by the British people that we should leave the European Union, and that's what we're doing," May responded. Conservative MP Andrea Jenkins added, "a second referendum would be a sellout and cause a huge amount of harm to trust in politicians." Parliament is set to vote on a new version of the deal on Jan. 29. May has until then to resolve the obstacles that thwarted her earlier plan. So far, lawmakers remain pessimistic. "I'm sorry but this just isn't good enough," said MP Anna Soubry of May's Conservative Party. "Last week it was a historic defeat. This house has spoken. It has rejected overwhelmingly the Prime Minister's deal, and here we are with another week of can-kicking, and the truth is ... nothing's changed."